How about something exotic from Japan? 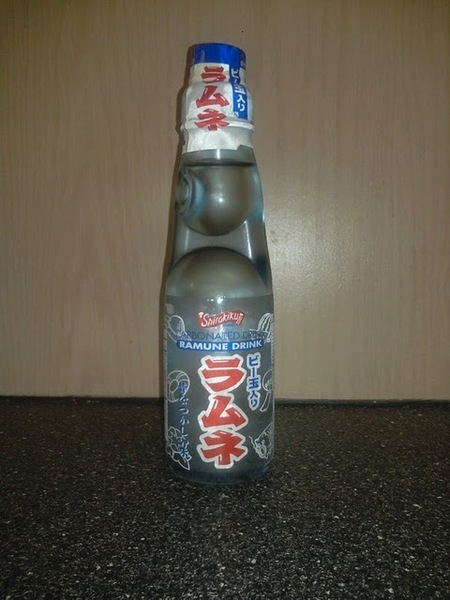 Here's something: Shirakiku Carbonated Drink! Wait, carbonated drink? Sounds kind of dull. Well, I'm thirsty, I'll give it a try. This sure is an unusual bottle. Ah, a seal. Let me take that off. Boy I'm thirsty. Oh, it's still sealed. In fact it looks like…is that a marble? Wait, there was another piece of plastic under the seal. It seems that I have to remove something from the piece of plastic. Ah, it's a plunger. I have to remove the plunger from the plastic and press down on the marble. There we go. Now to enjoy! Hmm. Actually, the lip around the hole at the top of the bottle is huge. I don't think you can actually drink out of the bottle. Not a problem, let me just pour this into a glass. Here we go, a nice clean glass to pour into. That's weird, it's not coming out. Oh, yeah, the marble. It keeps blocking the liquid. Boy, I sure am thirsty. Well let me just try to get this at the perfect angle so that it pours in properly. Any time now. Finally. A nice cool glass of carbonated drink.